We’re happy to report that WMPG volunteer Fred Greenhalgh and his production company FinalRune was featured in the Wall Street Journal on February 25, 2010. The article, entitled “Return With Us to the Thrilling Days Of Yesteryear – Via the Internet,” heavily focused on his signature field recording style and director Fred Greenhalgh’s passion for reviving audio drama in an age of the iPod. 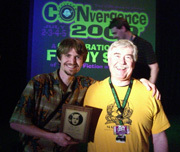 Fred Greenhalgh also recently won a Gold Ogle Award, an international audio drama award for Best Fantasy Audio Drama.